Some students at Smithfield Middle School in the Birdville Independent School District head back to class Monday with pride in what they pulled off over the weekend. "I think it's incredible that people like us can do something to help the community. This is an accomplishment for us," said Ella Kinney, a 7th grader. About 150 people braved the storms Saturday to support Kinney and members of the school's Back the Homeless club. The students wanted to raise money to buy backpacks and stuff them with items that can help the homeless. 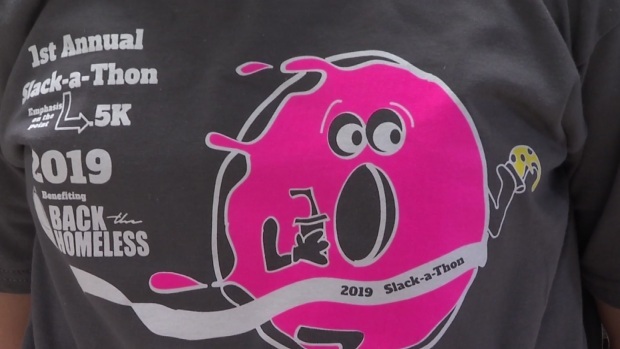 Zane Sheffield, the president of the club, suggested the first-ever Slack-A-Thon, a .5K fundraiser where people could walk or run, if motivated, with carb-loading stations along the way. A group of Birdville ISD students is on a mission to help the homeless in Tarrant County -- and they thought a fun run would be a good way to raise awareness and money for their efforts. But they wanted to make sure their event would appeal to people who don't necessarily want to sweat through a 5K on a Saturday. The participants included 146 people who people showed up and another nine VIPs. A VIP, said Sheffield, "is a virtually inactive participant. Someone who pays to support the mission but doesn't participate." Fran Ussery wanted to be there. She saw the story on NBC 5 and knew she and a friend had to go even as rain pounded her on the walk from the parking lot to the school building. The kids' passion motivated Ussery to go. "Their own excitement did it, and the fact that they're looking at a mission that has something to do with their community past themselves is a really good thing," Ussery said. The so-called "slackers" like Ussery loaded up carbs like donuts, pizza, nachos and more along the .5K which breaks down to about 1,600 steps. "I think this is going to be really helpful to get those backpacks to people in Tarrant County and make their lives better," beamed Sheffield. Sheffield hopes to take the Slack-A-Thon with him to high school and inspire other middle schools in the Birdville ISD to host one, too. Do you have #SomethingGood to share? Email your story idea with pictures or video to iSee@nbcdfw.com.